Accessories, spares and parts are still available for your RoadMate 800. Brought to you by the creators of Hertz NeverLost®, the Magellan RoadMate 800 has the latest in turn-by-turn GPS guidance, plus built-in MP3 player and photo viewer making it a navigation and multimedia marvel. The 3.5-inch color touch screen shows your position with multiple views including a maneuver list. Simply select a destination and your Magellan RoadMate 800 GPS navigation system will guide you through every turn. It automatically calculates the most direct route and recalculates whenever you take a detour or make additional stops. Routing options enable you to choose the best routing option for you - shortest time, shortest distance, stay on or stay off the freeway. Customise every trip to easily avoid toll roads or exclude selected streets. SmartDetourT will automatically route around stopped motorway traffic. With the integrated rechargeable battery you can use your Magellan RoadMate 800 even when you don't have access to power. Use it to view photos of your family and friends when you are away from home, listen to your favorite music with the built-in speaker or use the included headphones, or enter addresses and trips from wherever you are. Built-in European detailed street maps and over 1 million pre-loaded points of interest make it easy to find the nearest restaurant, gas station, hotel, airport and more. It has never been easier or more fun to get around town or take long trips to distant locations. And if traveling abroad is in your plans, this GPS system comes pre-loaded with detailed maps of North America that can be unlocked for a fee. The advance features of the Magellan RoadMate 800 provide easy, powerful and personalised GPS navigation, plus on-the-go multimedia. The Magellan RoadMate 800 has been designed to be Plug & Play, and as such can be transferred from vehicle to vehicle with ease by the user. 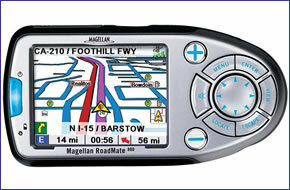 The Magellan RoadMate 800 is powered using a 12-24 volt adaptor cable in-car. The provided mains A/C power adaptor allows for use in the home or office, when configuring a route (cables included). As the Magellan GPS RoadMate 800 features a preloaded 11GB micro hard drive with detailed maps of UK and mainland Europe; The RoadMate 800 is ready to use, right out of the box, since there is no need to download/install any maps. Looking for accessories and spares for the Magellan RoadMate 800? We sell a very limited range of genuine accessories including travel carrying case, protective case, car charger and external GPS antenna. Do you have a question about the Magellan RoadMate 800? Submit your question via our contact page.